You are here: Home / Diet & Fitness / How Much Calories Should I Eat To Lose Weight? Let’s begin by taking a look at calories. You hear the name so often. You think of them every time you eat. But have you ever really looked into what calories are? Not many people do and the thought pattern is that calories make you gain weight. Not necessarily. Excess calories can make you gain weight, but not eating the required amounts that our body needs can cause the body to go into “starvation mode” and keep the weight on. Calories are simply units of energy that create heat. This is what our body uses to keep going. So, it is a fact that our bodies need calories. It works like this: You eat a certain food with a certain amount of calories. Each calorie is a unit of energy. 1 calorie = 4.2 joules. 4.2 joules has the ability to raise the temperature of water 1◦ Celsius. When a dietician talks about a calorie, you will hear them use the term kilocalorie, which is the equivalent of 1,000 calories. They do this to more accurately measure the caloric content of certain foods and the affect they have on the body. They then move on to express the energy units as, kilojoules. This more accurately depicts the energy created by foods. Maintenance – Eating the exact number of calories that you burn every day. Weight Gain – Eating more calories than you burn with activity. Weight Loss – Eating fewer calories and increasing activity. How do I know how many calories my body needs? In order to determine actual caloric needs, you will need to take a look at your activity levels in the next section. Multiply your BMR x the percentage of your activity level and add them together. The total will be your caloric needs each day for weight maintenance. One way you can do this in a healthy way, is to continue to eat your calorie requirements for maintenance and increase your exercise. 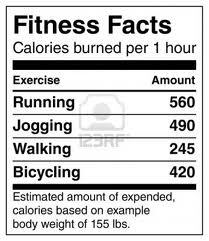 You then subtract the amount of calories burned from exercise. This means you burned extra caloric needs from surplus energy or fat in the body. How much should I exercise and what are some good exercises? You add the activity level to the BMR and that is your caloric needs each day to maintain the weight you are at. The female example above would need to eat at least 1500 calories a day to maintain a healthy weight. Finding the right amount of calories for your body is easy to do in a few steps. Then all you have to do is increase your activity levels with fun and healthy exercises a few times a week. Decreasing the calories you eat should come from removing things from the diet like; high-fat foods, fast-foods, sugary carbohydrates (but not all carbohydrates are bad), processed foods and sodas. Learn to shop the perimeter of the store and buy the freshest foods possible. With a few easy lifestyle changes, you will be on your way to a healthier you!